Buy, Rent or Skip Off the Rails: Aboard the Crazy Train in the Blizzard of Ozz? First off, I gotta say that I've met Rudy Sarzo and he is a very cool dude, easy to talk with and an all around great person. So, I was happy to hear that he was writing a book about Randy Rhoads, one of my all time favorite guitar players. There is so little about the man and the myth that I figured that this would be the book to lets us live vicariously through Rudy and learn a little more about Randy in the process. Sadly, that's not the case here. I really wanted to love this book and soak it up as best as I could, but the writing isn't the greatest. 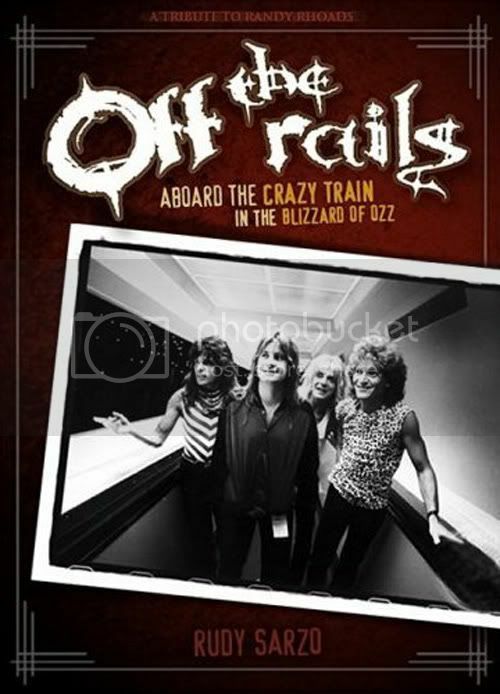 First of all, Off The Rails comes off like nothing more than a itinerary for both the Blizzard Of Ozz and Diary Of A Madman Tours. There is a lot of "we drove here, we drove there, this show was cancelled, that show etc...." The other thing I had a problem with was the "conversations" between Rudy and Randy and everyone else. There was so much dialog between the two parties that at times it really did feel like reading a screenplay. Even though this book is dedicated as a tribute to Randy, it read more like a biography of Sharon Osbourne more than anything, with Ozzy getting second billing and then Randy. After reading the entire book, I still don't know all that much about Randy Rhoads and what's even worst is that I don't know all that much about Rudy himself and this was HIS book. It may sound like I'm bashing the book, but it's not all bad. There were some pretty funny moments and some eye opening accounts that even I never knew about till reading this. For starters, I never knew that Rudy's brother was hired as Randy's "replacement" and only at the 11th hour did he lose the gig to another guitar player. Also, the book shines for Rudy as a writer when he is recounting the day that took Randy from us and the days that followed. It was very poignant and heartfelt and you could tell Rudy was just writing it from the heart and not trying to write a "book". I personally won't ever re-read the entire book again, but I can definitely say that I would read those 2 chapters (see above) again if I come across the book in the future. This is definitely a Rent at best. More Randy Rhoads can be found here. Click Banner.